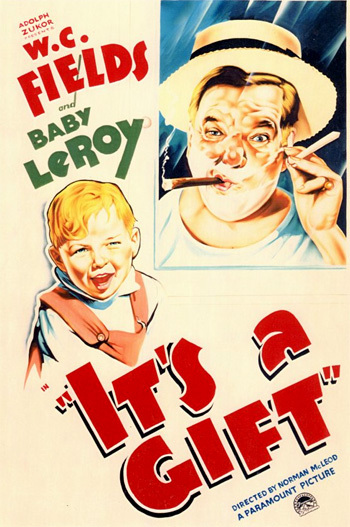 Typical of Fields' films, he lampoons all the things in life he disliked the most: children, family life, salesmen, bothersome neighbors, and shrewish, nagging wives. The comedian/actor appears in virtually every scene as a hassled grocer, with a running monologue lampooning human behavior with masterful verbal humor. Memorable characters have a diversity of strange names - Muckle, the Dunks, and Bissonette himself (pronounced with dignity and social pretension: 'Bis-son-ay,' something that the characters are constantly corrected and reminded about in the film). The credits play over a back-projected view of downtown Hollywood. The Bissonette family (with Pop driving, Mom in the passenger seat, and the two children in the back seat) is the archetypal American family. They are seated in the open car that tours down the urban street. "California Here I Come" plays on the soundtrack. At the credits sequence progresses, the backdrop changes to country road scenes. A postman delivers a letter - addressed to Mr. Harold Bissonette - to the front of a three-story apartment house on a suburban street. Amelia shrieks at Junior, 8 year-old son Norman Bissonette (Tommy Bupp) for skating around the house: "Stop that racket. Give me that letter! And take those skates off, I told you. Clattering up and down the stairs all day." It is early morning and the family has just received a letter from Aunt Matilda about the expected demise of Uncle Bean. Loud-mouthed Norman blurts out his father's overriding dream to move to California and buy an orange grove and ranch with the inheritance money: "Hey Ma! If Uncle Bean dies, Pop's gonna buy an orange ranch out in California, ain't he?" Norman teases that the move would separate his demanding, prim sister Mildred (Jean Rouverol) from her boyfriend, salesman John Durston (Julian Madison). Mildred: Pop, hurry up. I want to come in. Harold: Well, come on in. I'm only shaving. When she barges in, he is in front of the medicine cabinet, shaving with a straight razor in his hand. The willful daughter ignores him, monopolizes the space, and opens the medicine cabinet door to find her lipstick. Harold moves to the side and continues shaving. But after finding her lipstick, she closes the cabinet door, uses the mirror, and applies her lipstick. So Harold moves around, trying to see into the mirror from behind her. She continually threatens to jiggle and hit her father's shaving arm that is precariously poised with a sharp razor. Mildred opens the cabinet door, a second time, to find her hair comb. Harold once more moves around to the side to use the mirror - just as she shuts the cabinet door. Once again from behind, he attempts to see past her as she flips her hair back with her comb. He gets a wad of her hair in his mouth and lets out a bleating, choking gasp. If you want me to cut my throat, keep that up! (She gargles again and he mumbles) Evidently do. Amelia: What kind of tomfoolery are you up to now? Amelia: Of all the driveling idiots. Hurry up and come into breakfast. Harold: I'll be down in half a tick. Don't be kicking Norman's skates around the house. I've just had them fixed. Norman: Do it again, Pop! Ha, ha. Amelia: Did you hurt yourself, dear? Harold: Shut... (he catches himself) No, no I didn't, thanks dear. (To Norman) Where's your other skate? Norman: I got it on. Harold: (gesturing) Well go and put that one on! Amelia: Norman, I told you to take those skates off. Harold: Yeah, go and take those skates off. - What are you trying to light the flower for? - Don't smoke at the table. - Don't throw matches on the floor. Norman: What's the matter, Pop? Don't you love me anymore? Harold: (pulling back his arm as if to swat his son) Certainly I love ya. Amelia (shrieking): Don't you strike that child! Harold: Well, he's not gonna tell me I don't love him. Amelia: Harold, I want one thing settled. If you get any money from your Uncle Bean, you are not going to buy an orange ranch with it. Harold: Oh, no, no, no, no. Amelia: Don't try that innocent look with me. We need things in the house. I haven't a STITCH to my back! The children need clothes. And we should have a car...I don't know where you get the idea you can make money raising oranges when you can't even run a corner grocery store. Harold: I know a lot about raising oranges. Amelia: What are you so nervous about? You haven't eaten a bite. Amelia: Well, that won't be worth eating if you put any more salt on it. Apropos of nothing and to break Amelia's endless string of nagging complaints, he picks up the skate and asks: "How much did it cost to fix these skates?" Hearing the eight o'clock whistle blow, he retreats into the kitchen as his wife's voice continues to jabber away at him with incessant commentary. Mildred: You're just trying to ruin the lives and future of everybody in this family. Mildred: You don't care how much you take me away from people I like. Amelia: Harold, are you listening to me? Amelia: What did I say last? Harold: Yes, yes, every word of it, yes..
Mildred: I never knew such an ungrateful father. Harold: (to Mildred) Listen, you've all got to realize one thing that I (he tentatively glances in the direction of his wife, and then whispers so his wife won't hear) am the master of this household. Harold tiptoes out of the kitchen, into the hallway, and then down the stairs. He sneaks out of the house to avoid the lecture that his wife is delivering. The next sequence is one of the funniest routines ever filmed - a marvelous collection of slapstick and sight gags. Now the ever-accommodating victim of his store customers, Harold arrives at his small grocery store which he runs with the assistance of an inept helper Everett Ricks (Tammany Young). Everett functions as a focus of exasperation for Harold. While Harold is distracted by a young girl who holds up a piece of chalk and asks if he wants to play hopskotch on the sidewalk, Everett unlocks one of the store's two front paneled doors. Harold returns to fiddling with his key to open the door. When he notices one panel of the front door is already open, he proceeds into the store without unlocking the second door. Everett: The door was open. Harold (to Everett): Open the door for Mr. Muckle. Harold: Open the door for Mr. Muckle, the blind man! Fitchmueller: HOW ABOUT MY CUMQUATS? All right. Think nothing of it. Just a little glassware.